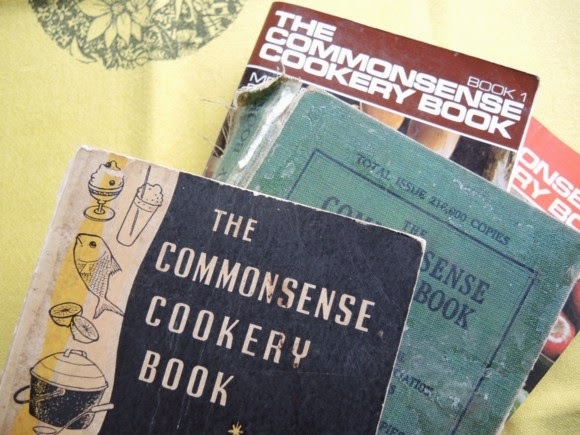 I'VE written about my Commonsense Cookery Book collection before. There's the 1978 versions of books No.1 and No.2. There's a 1964 version, which contains my favourite advertisements and graphics, and my pre-World War II version, dating back to 1939. The books are my go-to for old favourites like pikelets and scones and rock cakes and was where I hunted down a recipe - three actually - for gem cakes this past weekend. I bought a gem cake pan for $4 at an op shop weeks ago and used all three of my Commonsense Cookery Books to work out how to use it. Gem cake pans, or gem irons are, as the name suggests, made of cast iron and mine dates bake to the days of wood-fired stoves - as does my oldest Commonsense Cookery Book. 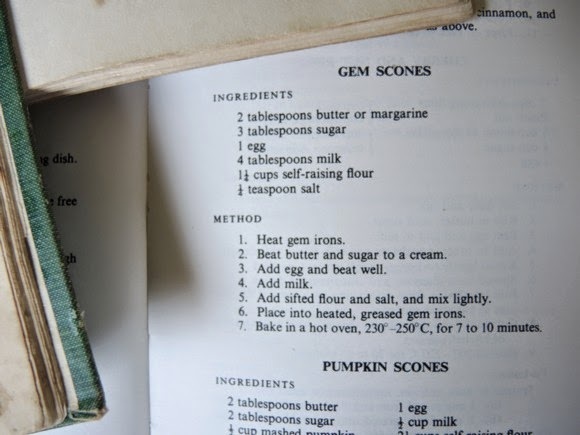 In the 1939 edition, the recipe for gem scones calls for plain flour and lists rising agents, along with a 'gill' of milk. The method fails to mention pans need to be greased and is pretty loose about the oven temperature. "Hot" is all it offers. Back in 1939, any owner of the Commonsense Cookery Book was supposed to know exactly what to do with the listed ingredients and meagre method. 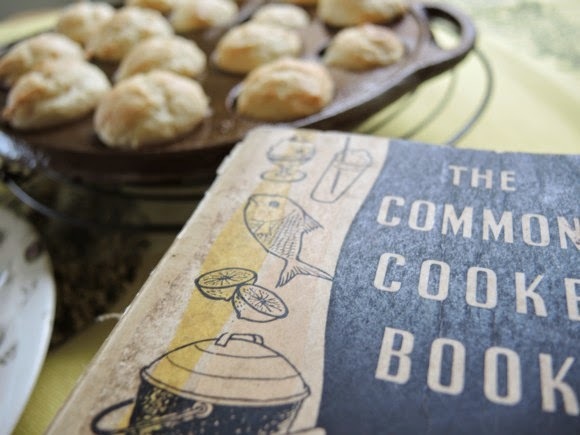 The 1964 book uses self-raising flour, but again calls for a "hot" oven. A "greased pan" is described but it's not until the 1970s that more precise descriptions are used, including oven temperatures. 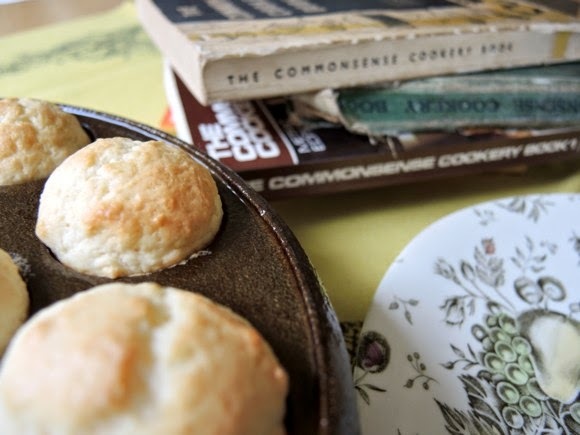 With three editions, a vintage gem pan and my modern kitchen I did succeed in baking gem scones. They're a lovely little light scone that's just the right size to pop in the mouth, hot or cold, and best served with a steaming cup of tea. I can't find any description of how they're supposed to be eaten but we dolloped jam on top. If you wish to secure your own copy of the Commonsense Cookery Book, you'll have no trouble finding it. It's been in print continuously for the past 100 years, with a centenary edition out this year. These look great Katie...good old fashioned cooking! Thanks for your comments on the Commonsense Cookery Book. I stumbled on a copy and noticed the insane times they had for cooking vegetables, all vegetables.. like boiling for 20 to 30 minutes for peas and beans etc! They reduced these times over the decades in later editions. I then found a copy on the web and bought it. It was a 1944 copy on rough paper (paper supplies to printers were rationed during the war) and a linen (?) soft cover. Why did the government allow scarce paper to be used for a cook book? My guess is that it would have been very useful for people (young soldiers, nurses etc) who were posted away from home and hadnt been taught by their mothers how to cook.